I hope you are all having a happy Thursday. Tomorrow is Friday and I think we can all agree that is a good thing. I would like to take this post to introduce you to one of our talented Creative Team members Carol Bauer. Carol Bauer is a 25-year designer, author, speaker and instructor in all things beads. Her designs and articles have appeared in a number of magazines and books. Carol loves to teach and gets great satisfaction guiding students through the process of beading and will take any opportunity to share. She teaches on land at various locations, at sea with Craft Cruises, on TV with Beads Baubles and Jewels and online with Shipwreck Beads. So, without further delay, here is Carol! Day 1 – I am a member of the Creative Team at Shipwreck Beads. 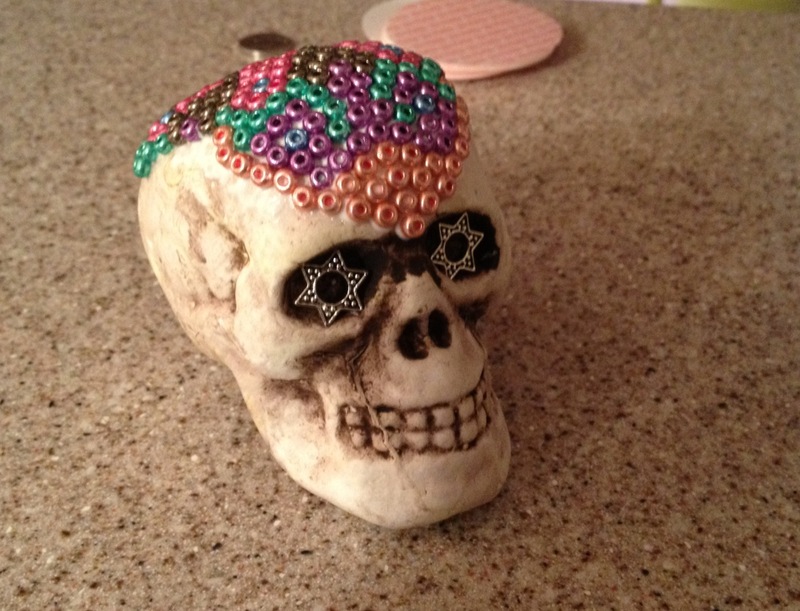 Recently I was presented with a Styrofoam skull and the challenge of decorating it in any way I chose. The end result would be an inspiration piece for our contest celebrating the Halloween and Day of the Dead. I have always been a fan of Huichol beadwork and decided that this would be the perfect time to try my hand at this spectacular art technique. I chose a selection of 5-0 seed beads in colors that are not traditionally used. 5-0 beads because I did not want to have to spend years covering my skull with smaller ones. Yikes! The deadline was looming. 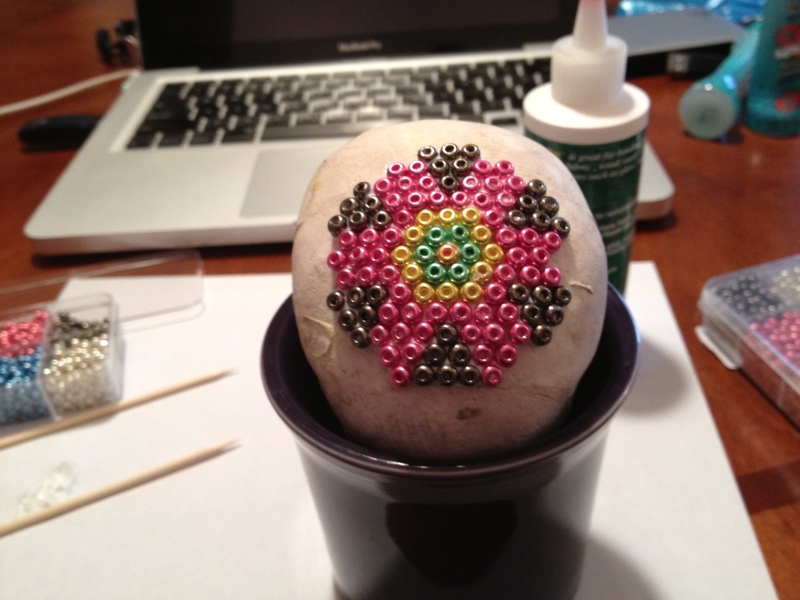 Day 2 – The beading begins. My tools consisted of a bottle of white glue and some bamboo skewers I had around. I would make a small puddle of glue, stab a bead with the skewer and dip it in the glue. 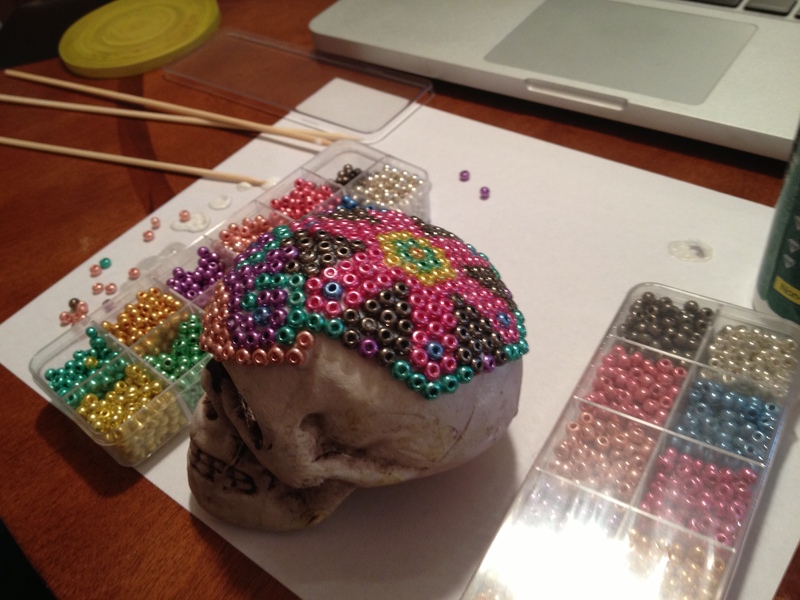 I would place the bead on the skull with the skewer and hold it in place with my finger on the other hand. I learned quickly that gravity is not my friend and depending on severity of the curve of the skull, my beads liked to slide. I found that letting the glue dry slightly into a gooey sticky blob improved the tackiness of they stayed put better. Tip two – Wash your bead finger often as the beads like to stick to the glue that will end up on your finger. 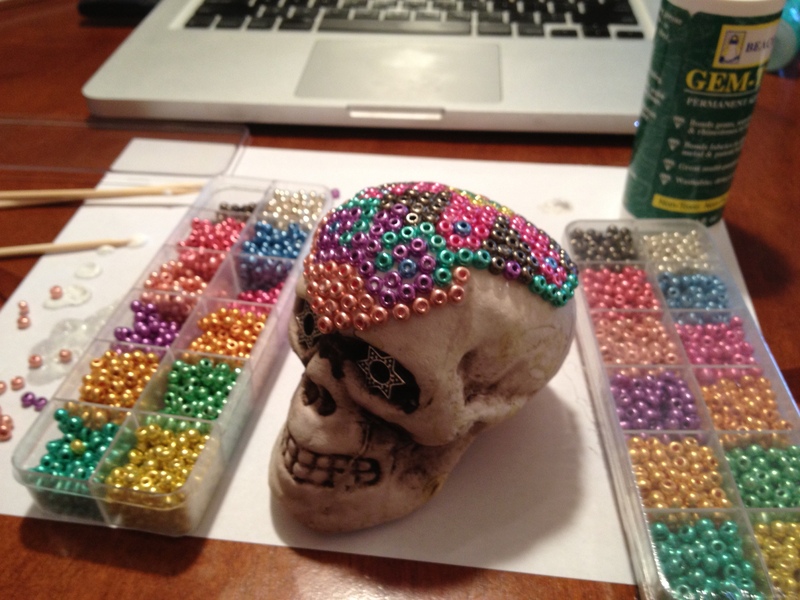 Tip three – Beads on a Styrofoam skull make the skull top-heavy. Early into the project I put my skull in a coffee cup. Later I propped it up between the bead containers I was using. Tip four – The bamboo skewers were an awesome tool. When they got too gooey I just grabbed a new one. When the first one dried I could pick the glue off and reuse it. Tip five – When you have a deadline do not wait until the last minute to start your project. The pictures show 2 hours of work and I missed my deadline. On a happy note I was asked to blog about the project and share with you as it progresses. I will be back in a few days with more pictures and an update. Thanks so much to Carol for sharing her progress with us. She will be checking back in later to show us the continued progress! Keep those sugar skulls coming, the October 19th deadline will be here sooner than you think!